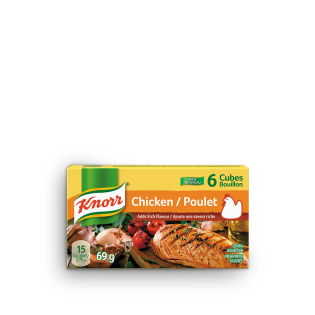 Knorr Bouillon Chicken Cubes are a delicious blend of chicken, onion, parsley and spices, and add a bold taste of chicken to your favourite recipe. Knorr cubes are easy to use, quick to dissolve and add rich deep flavour to your soups, stews, sauces, gravies and risottos. Salt, monosodium glutamate, hydrogenated cottonseed oil, chicken fat, hydrolyzed soy/corn protein, dehydrated mechanically separated cooked chicken, dehydrated chicken meat, dehydrated chicken broth, autolyzed yeast extract, dehydrated onions & parsley, lactose, water, colour, spices & spice extract, disodium guanylate, disodium inosinate, citric acid, tartaric acid, hydrogenated soybean oil and sulphites. Dissolve 1 cube in 2 cups (500 mL) boiling water.